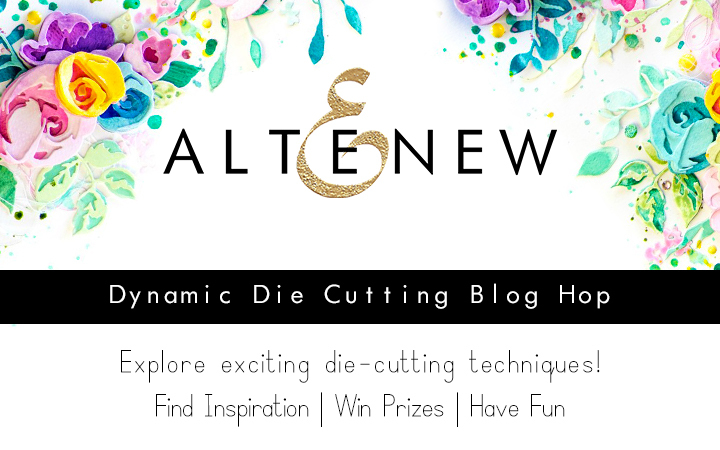 And welcome to my stop in the Altenew Dynamic Die Cutting Blog Hop! You should have arrived here from Kymona Tracey`s blog, however if you need a map, a full list of the blog hop is listed below. How exciting to be a part of this Blog Hop! YAY! So I hope to inspire you with my project today. I really wanted to do something unusual for this day, to use Altenew dies a little not in the traditional way. So the idea with embroidery, yes, natural cross stitch, so that the card could not only be seen, but it is pleasant to feel. And my choice fell on my favorite Sewn with Love Stamp Set with Sewn with Love Die Set. But of course, for my card I took only a Sewn with Love Die Set, and the image scheme of the flower used from a set of stamps. I started with preparing the stitching panel — die cut flowers on the cream card stock. The meaning of this die is not in the cutting of elements, as we are used to - it makes holes for embroidery or stamping with imitation embroidery. Also I thought about the color scheme. It was important to choose a palette so that the colors passed from each other, creating layers, as in multi-layer stamping. When I finished the stitching, I adhered my panel to the card base. But first I fixed it around the perimeter with glue. This helped me to fix the embroidery so that when I cut the panel on the edges, nothing fell, and the image turned out perfect! And also I added "YOU" sentiment die cut it using the Caps Bold Alphabet Die Set in white. 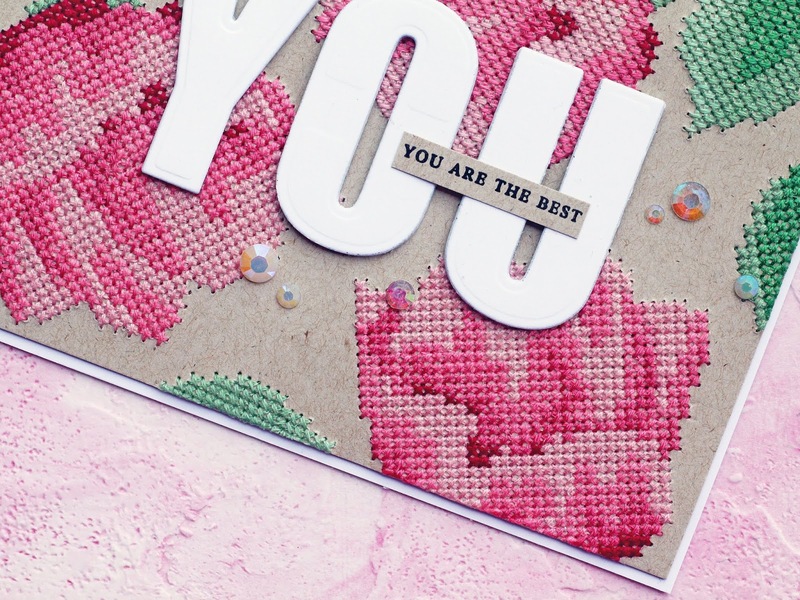 I also added a sentiment "You are the best", taken from the same set and decorated the card with crystals. Thank you for visiting the my stop in the hop! Head on over to your next stop, Heidi Jakobs! I will be giving away $20 gift certificate to ONE lucky winner from the comments left here. I will announce the winner on 11/2/2018 here. That is a true labor of love, and so beautiful! Totally awesome, Olga! A lot of work with gorgeous results! Love it! Wow..so neat Stitching ! I loved your card. vot eto rabota!!! mne na takoe ni vremeni ni terpeniya ne hvataet) super! This is absolutely gorgeous. Thanks for sharing. Wow! Very impressive. I love your card. Wow! This is soooo beautiful! I've had that stamp and die set for ages but haven't done anything with it yet. Thank you so much for the inspiration! Beautiful! I have not seen this technique before. I love it! Thank you for sharing. I'm going to look online for a complete tutorial for this technique. This looks like real stitching! Great job. Really beautiful, but I'm not sure I would have the patience. Love your flow of colors. Love your card. I have the alphabet dies. Love them! Love the stitched background. What a special card! Beautiful! This is CRAZY! I can't believe you did a stitched background! It must have taken forever! BUT IT IS GORGEOUS! What a lovely background, such a labor of love for the craft! Your card is very pretty Olga, thanks for the inspiration! So much work went into this, but the result is gorgeous! Fabulous card, so sweet and striking! This is very pretty, especially since you made sure to add layered colors in such a deliberate way. Such a great idea! Wow! Gorgeous stitching! Love the colors and this card is stunning! Wow, those flowers are gorgeous times infinity! The embroidery looks so real! Wow!! your card is beautiful.I love the embroidery and your color choices so much.Must have taken you quite a bit of time to make this.Its totally worth the effort though!! I love this card!! Your stitch work is beautiful! I really enjoy embroidery and will definitely have to try some on a card! Wow! Amazing card, can't believe the detail and workmanship. So absolutely gorgeous, it's definitely labour of love! That's a card for a super special someone for sure! Beautiful card, I love the colors you chose. I do a lot of cross-stitching myself, so I appreciate the effort that went into making this card. Wow! Absolutely stunning! Love this card. This is so beautiful, Olga! I used to cross stitch a ton, but haven't for years. I love the idea of having it on cards. This is absolutely fabulous. Love the texture and the design. OMG! This is beautiful. The amount of work you put into this....well a lot! It is beautiful enough to frame! I would frame it and have it on my desk. Fabulous card! Love all the stitching! Beautiful card. Amazing stitchery! Gorgeous color choices and design. What a beautiful card!! Fabulous!! 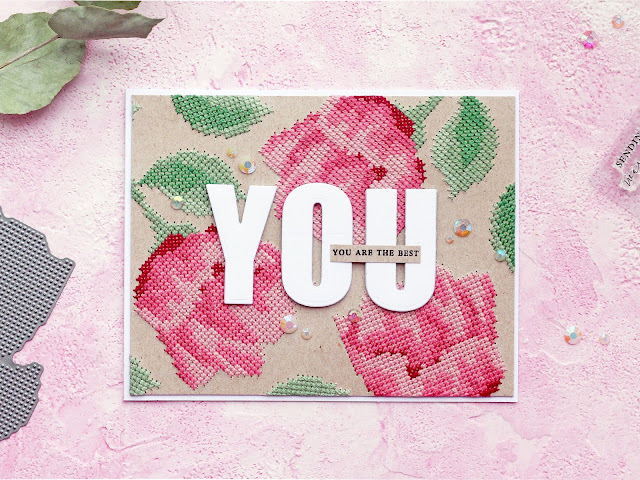 Lovely cards.....love the unexpected colors of your confetti card. Gorgeous colors and textures! Beautiful card! It should be framed! Oh! My! Gosh! You actually stitched the images!!! WOW!! Your stitches are perfect! You put a lot of love in to this card. This is amazing, beautiful job!! so pretty! my eyes are too bad to cross-stitch anymore but I sure do luv the look of it! I love to do counted cross-stitch. This die is a fantastic idea. I love that cross stitched card - just love it! Beautiful card. I love the colors and your stitching is perfect. WOW!! This is amazing. The cross stitching is so fabulous!! your stitching card is fantastic, Olga - love the colors you chose! Oh my goodness this is absolutely gorgeous! Talk about being handmade this is the ultimate of a handmade card! The colors are just beautiful! 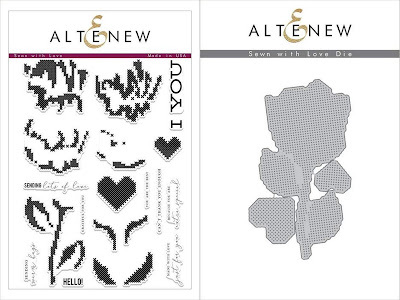 Really pretty stitched flowers! Nice sentiment too! You really made a gorgeous card!! I know a lot of work went into this. I’ve been cross stitching for 40 years. You did a very good job. Beautiful colors!! Some of my most favourite Altenew products are my layering dies. 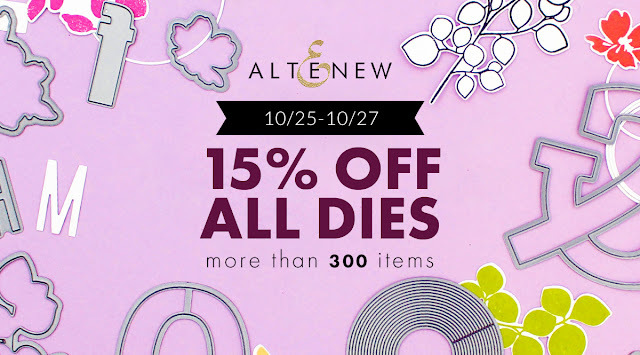 I love the Fantasy floral dies and the Rose flurries and the Peony Dream flowers that these dies make. Thanks for the fantastic inspiration! 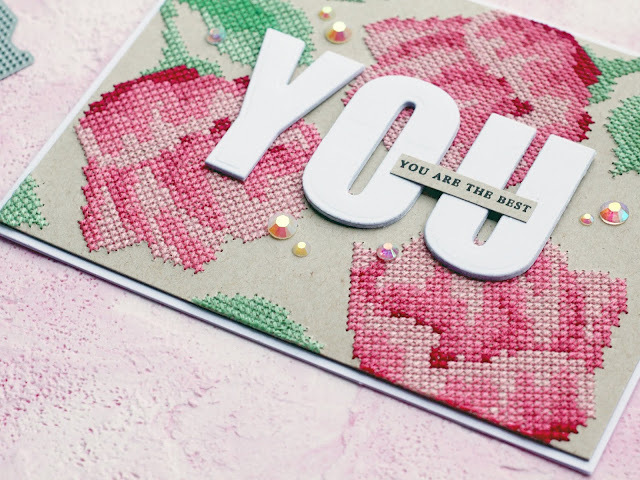 Your card combines two of my favourite things: cardmaking and sewing! Lovely idea, beautiful job cross stitching.